Police officers across the country work to protect our communities, yet we often forget that they are people, just like us. Police officers are often shown in a negative light in the media. It is all too easy for us to make judgements and fall prey to the stereotypes about law enforcement. For instance, if you were to walk into a coffee shop filled with police officers, it might make you feel unsettled. You’d immediately start wondering: Why are they here? What’s going on? Did something bad happen? On national Coffee with a Cop day, people all over the country ask themselves these questions. Once a year, coffee shops across the U.S. open their doors to local police departments. Police officers from the Costa Mesa Police Department (2016 city population: 112,822) meet in a local Starbucks and get to know the city’s residents. One officer bends down to talk to a child while another laughs with a barista as he orders his drink. The officers stand with relaxed shoulders and smiles on their faces. Members of the local community mill about the coffee shop, chatting with officers about topics ranging from traffic issues to their favorite football teams. There are no agendas, distractions, conflicts, or judgements -- just open conversations over a cup of coffee. Officers simply want to be liked and treated like normal people, rather than being feared. We often forget that cops are people too, and that the majority of them simply want to protect and serve our communities. Coffee with a Cop is a program that was started by the Hawthorne Police Department (2016 population: 88,031) in 2011 to remind people of this fact. Other departments began to follow in Hawthorne PD's footsteps, hosting their own Coffee with a Cop events. The program would go on to catch the attention of the Office of Community Oriented Policing Services (COPS), a Department of Justice program committed to advancing community policing across the nation by providing resources and grants to departments for developing their own community policing programs. COPS gave the Hawthorne PD a grant to develop a curriculum on how to put on a successful Coffee with a Cop event and to teach the program to other police departments. With the help of this grant, Coffee with a Cop began to reach communities throughout the country. By interacting with community members in a relaxed atmosphere, officers are able to build relationships and bridge the gap between the community and the police force. There are no boundaries during Coffee with a Cop events. Residents are encouraged to talk about anything that’s on their mind, which is part of the reason that Captain Ishii believes the program is so successful. Coffee with a Cop has become extremely successful, operating year round in all 50 states, along with 15 other countries. There have been over 10,000 Coffee with a Cop events worldwide since 2011. Programs like Coffee with a Cop are part of what is known as “community policing.” Community-based policing is a system that focuses on building relationships between police officers and members of the community. In order to foster these connections, officers are assigned to a certain location, rather than being rotated from place to place. This is not a machine. It’s a human being who bleeds just like you do and who has a personality, has kids, and he’s a jokester. 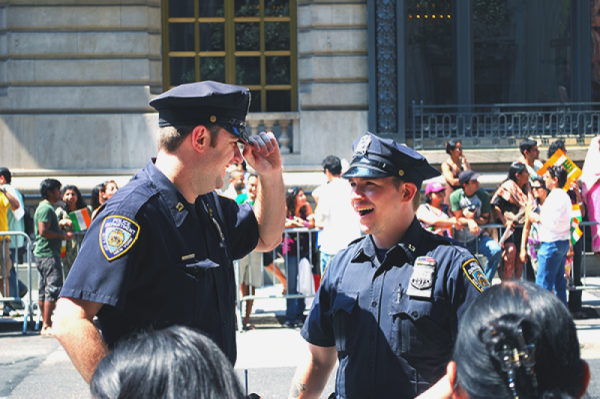 Some of the nation’s largest cities like New York City (2016 population: 8.538 million) have implemented community policing to build relationships and combat crime. The New York Police Department (NYPD) calls their initiative a neighborhood policing program, in which officers are assigned to patrol the same neighborhood on every shift. This has created consistency for both residents and officers. NYPD officers go through the Neighborhood Policing Program, which trains them on building relationships, de-escalating conflicts and communicating effectively with local residents. The training includes attention to small details that can make a big difference, like the officer’s posture, attitude and tone of voice. In 2017, New York City experienced its lowest per-capita murder rate in nearly 70 years. The city also saw reductions in other crimes, including robberies, burglaries and shootings. While these decreases in crime can’t be attributed solely to community policing efforts, many believe that the program has had positive contributions when it comes to reducing crime. One aspect of community policing that is used in police departments across the country is the Citizen’s Police Academy. The academy is open to members of the community, and it is a great way to get to know local law enforcement and how the department operates. Academy participants meet once a week with members of the department to learn about various topics, ranging from traffic enforcement to crime scene investigation to neighborhood watch. The program provides a hands on opportunity to live a day in the life of a police officer. The academy has become so popular within the community that most participants join after hearing about it through word of mouth. Fallah says that the majority of participants look for ways to stay involved with the police department even after the academy has ended. The program strengthens ties between the community and local law enforcement. It is easy for the public to see only the negative instances involving officers and to make generalizations about the entire police force. This is where community policing comes in; it allows police departments to show their communities that those negative encounters are not the norm. So what can we do to prevent those negative police encounters in the first place? Yet, because of the training you got, you knew what was right and what was wrong. Knowles believes it’s a matter of training. As of 2017, there were 24 states across the country that allowed officers to begin working on the streets prior to receiving basic training. This means that some officers are involved in high stress encounters without any training on how to handle and de-escalate these situations. This lack of training is often what leads to unnecessary use of force. The training process for officers at the LBPD is very rigorous. An officer is not deemed ready to work independently without supervision until about two years after their initial application. Beres says that the department provides training on a wide variety of topics outside of traditional officer training, such as mental health disorders, implicit bias training and sexual harassment prevention. These sessions take place throughout the year in order to keep officers up-to-date on their training. Officers and other department employees may be required to undergo additional training if they exhibit a pattern of mistakes or weaknesses on the job. While California has POST, not all states have standardized training requirements. This can create inconsistencies in the training that different officers receive. By increasing the rigor and amount of training that is required to become an officer nationwide, we can reduce the number of negative and violent police encounters. Coffee with a Cop events take place every day, all over the country. To find an event in your area, head over to the program’s events page. Many police departments will put on an annual open house. These events are a great opportunity to meet your local officers, tour the department and learn about what initiatives are taking place in your community. The Citizen’s Police Academy gives local residents an even closer look at what it is like to be a police officer. The academy is a great opportunity to better understand how the officers are working to protect your community. If your city offers this program, it will usually be listed on the police department website. Help protect your community by joining the neighborhood watch and alerting the authorities to any suspicious activity you see on your block. You can find a watch group in your area here. Police departments often put on kid-friendly events to bring the neighborhood together and engage with the community in a casual atmosphere. One popular event that many departments sponsor is an annual bike rodeo. At the rodeo, children learn about bike safety and get the chance to ride through a bike obstacle course. Events like these are typically advertised on the department’s website and social media pages. Beres, Jim & Fallah, Ross. Personal interview. 10 Oct. 2018. Coffee with a Cop. Coffee with a Cop. Hawthorne Police Department. “Find a Watch Program.” National Neighborhood Watch, n.d.
Ishii, Michael. Personal interview. 2 Oct. 2018. Knowles, Thomas C. “Cops Aren’t Your Enemy.” Politico, 23 Dec. 2014. Knowles, Thomas C. Personal interview. 2 Oct. 2018. Nandi, Anisha. “Neighborhood Policing Program builds Relationships to Cut Crime.” CBS News, 23 Mar. 2018. Perri, Jon. “This Former Officer Wants More Training for Police.” Change.org, 20 Sept. 2017. Is Online Voting The Future? Stadiums - Do They Make Or Break Your City?